1. Both parties must be present to apply. 2. Both parties must be over 18 years old (or 16 years old with parental consent). 3. Both parties must have proper, valid identification (Driver's License, U.S. Passport, or Birth Certificate and Photo ID). Cost of Marriage License - $56.00 cash, debit or credit card (for an additional fee), or money order (no personal checks). This does not include any certified copies. 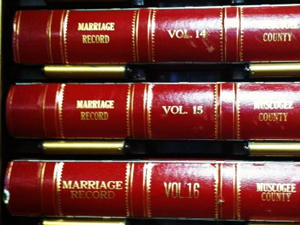 Certified Copies of Marriage Licenses and Marriage License Applications are $10.00 per copy and can be purchased once the marriage has taken place and the original Marriage License has been returned to Probate Court staff for recording. 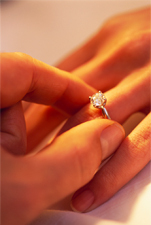 Marriage Licenses are issued from 8:30AM to 4:00PM Monday through Friday. Acceptable methods of payment are CASH, DEBIT OR CREDIT CARD (for an additional fee), or MONEY ORDERS ONLY. *Please note that these days are time are not guaranteed. Marriages are done if the Judge is available and not involved in hearings. You will need to come to the Probate Court to determine availability. 1.) The date of marriage. 2.) The full name of both parties on the marriage license. 3.) $10 cash, debit or credit card (for an additional fee), or money order (made payable to probate court) per certified copy. 3.) A return address so we can mail the copy back to you. 4.) $10 money order (made payable to Probate Court) per certified copy.